The other day, as I was finishing up teaching, I looked over at my coat hanging on the back of my chair, and the back vent was completely ripped out. It’s cold here now, especially at night, so this project jumped right to the head of my line. Fixing the outside part is actually not too big a deal. Thanks to interfacing and the aforementioned quality fabric, the stitches have popped but the outside fabric isn’t torn (the lining is another matter which we’ll get to later). 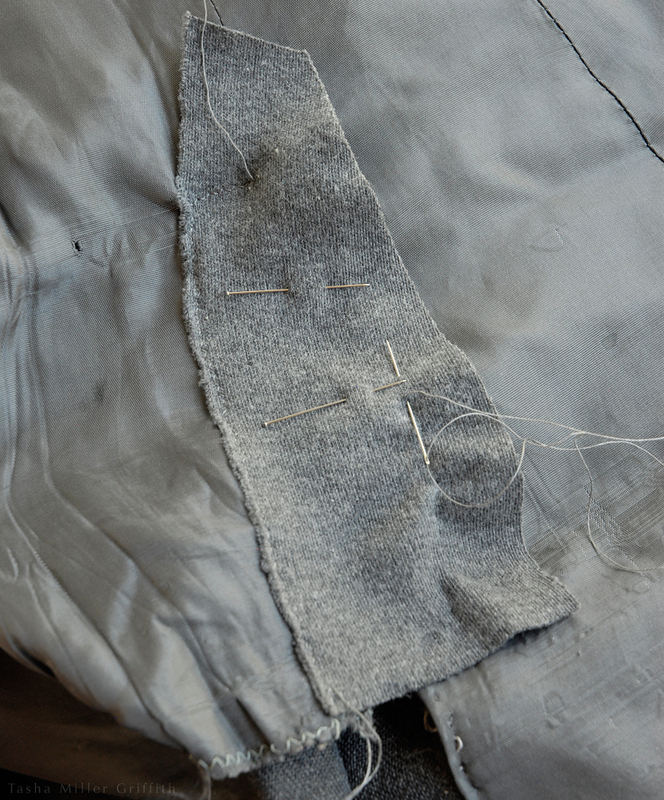 I lined up the vent in its original position, twisting the coat around to get a good angle for sewing. I can tell where the stitching was by the little channel the thread has left in the fabric, and by the bits of leftover thread. I lined up these clues, pinned things in place, and started sewing, overlapping the place where the original seam is still intact. I used a double thread and backstiches sewn by hand to replicate the old seam. I could have done at least some of this on the machine, but by the time I got the thread, stitch length etc. all sorted out, I figured this way was faster and easier. As near as I can tell, those bits of thick white yarn are for matching a point in the original construction, and weren’t used to hold anything together. When this coat does finally give up the ghost, I think I’ll take it apart and see what else I can glean from how the inside is put together. 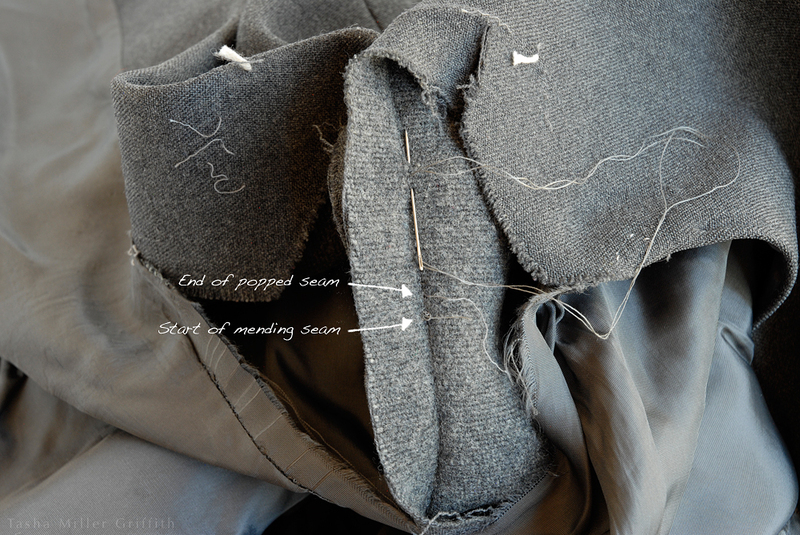 I’d love to make my next winter coat from scratch. 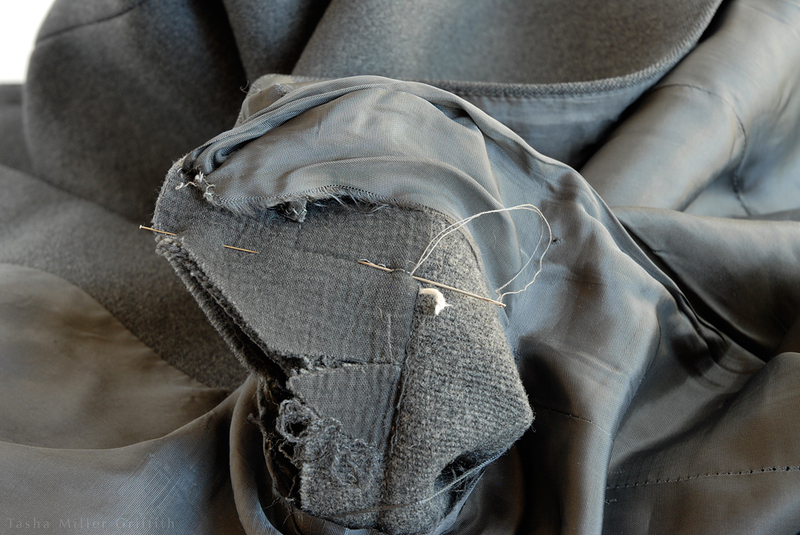 Back to mending for now; keep following the path of the old vent stitching. It makes several right angles which seem random, but they were obviously holding everything in the right place before, so just go with it. I found that right at the turn it was useful to make another pass and add a few more backstitches. It can be hard to get them as dense as you would like and still get through the thick layers. 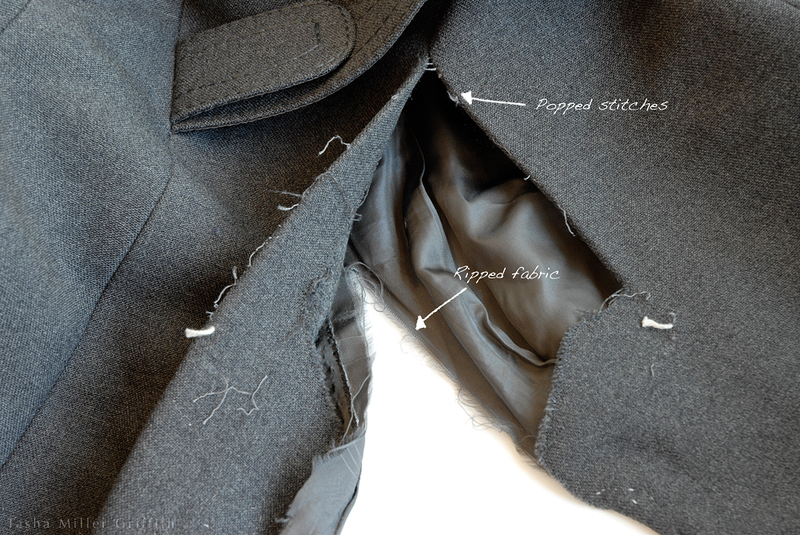 Turn the coat right side out and see if everything is held in place the way you would like. If not, it’s easy to add more stitches. So that’s actually about it, just keep backstitching until you get to the end of the old seam. Since that’s obviously a point of stress, I stitched in a little rectangle all around it to distribute the stress, rather than just following the path of the old thread. 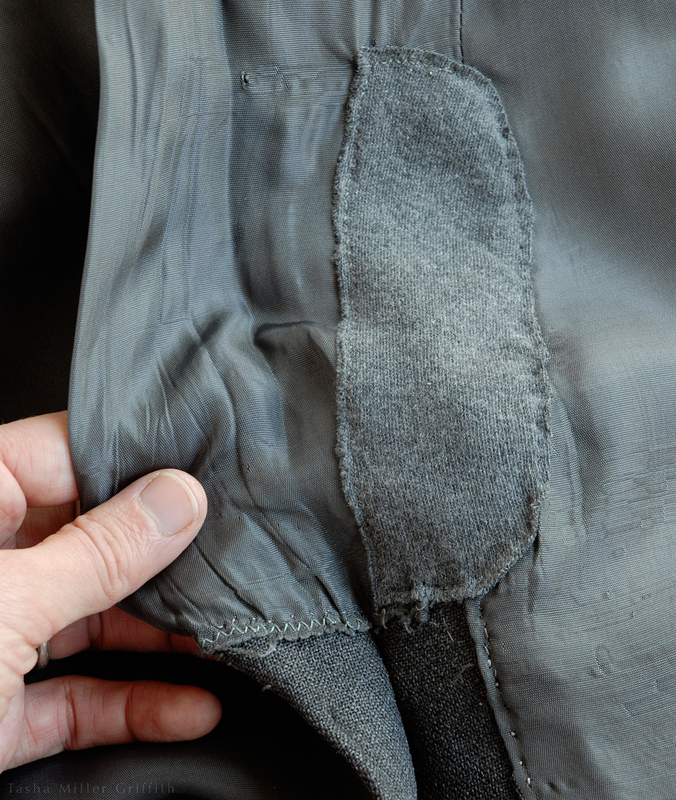 Flip the coat right side out, and if you are satisfied with how the vent looks, it’s time to fix the lining. Sigh, the lining. On the night that the coat vent busted, I described its lining to a sewing friend as “a hot mess” which pretty much sums it up. Whatever this (I’m guessing acetate) lining stuff is, it’s not nearly as nice or durable as the outside, so that at this point, particularly at areas which get lots of wear (like the vent, and where the sleeves join the coat body), it’s a patchwork of repairs reflecting the techniques, scraps of fabric, and even moods I’ve had over the past decade or so . . . at this stage my goal is just for it to hang together and not look too awful if someone happens to catch a glimpse of the inside. Since the fabric itself is ripped here, I needed to patch it with something. I settled on a scrap of grey knit fabric, because 1. I won’t need to finish or turn over the edges, since it won’t ravel 2. The color is a pretty close match and 3. a knit is stretchy, which might work well at an area that’s clearly getting strain. I sewed the first part of this patch on my machine, using a narrow zigzag stitch. It proved difficult to go around the top without everything bunching up under the machine foot, so I decided just sew the second side using backstitch again (but only one strand of thread this time). After stitching to the top and burying the thread ends, I trimmed the patch for a neater (ha!) look, and there you have it. I also tacked the bottom of the lining piece to the outside fabric. This has got me wondering about lining my fantasy next coat in a silk knit. What do you think? Could be pretty sweet . . .
Tada! Fixed. I just gave it a good press from the outside (a quick ironing with a lot of steam in the repaired part) and it’s good to go. Pay no attention to the other small hole, I didn’t even see it until I was editing the photos . . . I bet after all that you might like to see a picture of me wearing this fabulous, recently fixed, coat, yes? 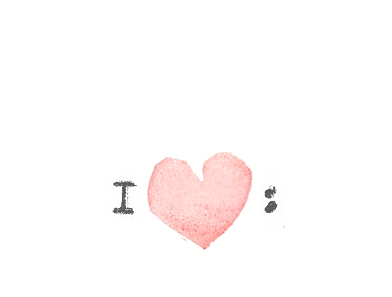 I know, it’s lovely, right? If you look closely, some of the repairs are more obvious. I’ve re-sewn the buttonholes multiple times, re-covered and attached I don’t know how many buttons, tacked down the tabs on the back belt every way I could think of, I put a bigger pocket in one side . . . but I’ve been more than paid back for time invested in repairs vs. time wearing coat. I think it has another season or maybe two left. The fabric right around the cuffs and front is starting to obviously wear. When it does go I may just copy it and make a few modifications. 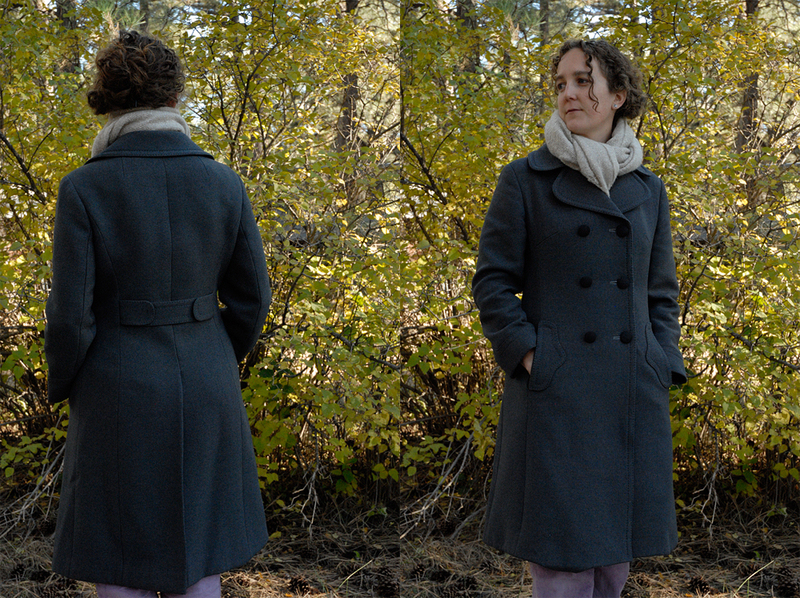 It occurred to me while working on this post that since this is my only real coat, I’d better make the new one while the weather is warm . . .
Here’s to extending the life of the things you love! 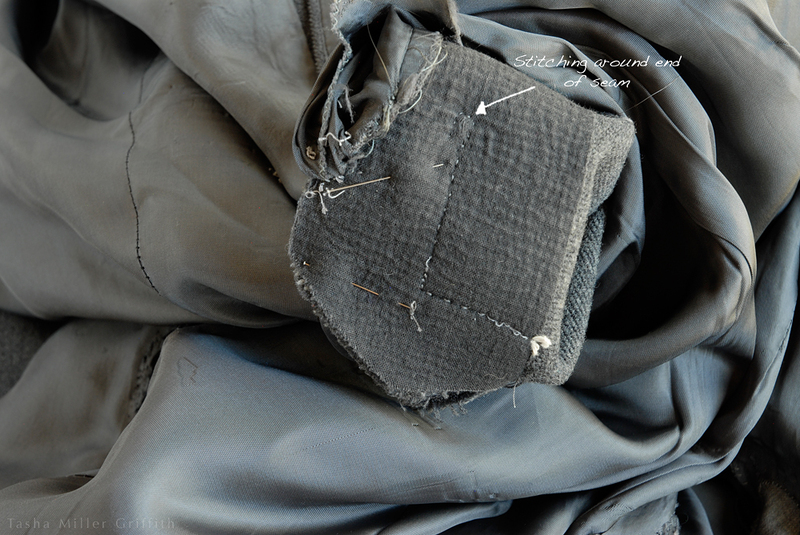 This entry was posted in Care & Maintenance—Remake—Repair, Sewing—Form and Fabric and tagged back vent, by hand, coat, diy, fix, jacket, mending, quality fabric, repair, ripped fabric, ripped seam, sewing, torn, vent. Bookmark the permalink.